Natomas Traffic Accident. A North Natomas traffic accident occurred during the morning hours of October 23 along Interstate 5 northbound that involved three vehicles and resulted in injuries. The Sacramento Fire Department responded to the collision to check on the reported injuries and provide emergency responders. At the time of this report, no information has been released on the identities of those who were involved in the accident nor have authorities provided further details as to the nature of the injuries. According to the California Highway Patrol (CHP), the accident happened near North Natomas Regional Park just south of the eastbound Del Paso Road on-ramp. It involved a Honda Civic, a taxi and a semi truck pulling a long bed. The vehicles were reported as blocking the number one lane, and several tow trucks were called to the scene to remove them. All lanes were open a short time later after the vehicles were removed to the center divider to allow traffic to pass. It is unknown whether those injured were treated at the scene or transported to a hospital for further treatment. The cause of the accident will be under investigation by the CHP to determine fault. It Is not known whether drugs or alcohol were a factor in the crash. A Natomas traffic accident can involve more than one vehicle. When this happens, it is necessary to determine the reason why the accident occurred. It may be that one car was recklessly speeding or a driver was not paying attention, or it can involve a rear end accident. Whatever the cause, more than one vehicle can be at fault, particularly on crowded urban streets or highways. Due to this carelessness, drivers and their passengers can suffer serious or life-threatening injuries ranging from cervical strain and sprain to traumatic brain injury or paralysis. When injuries happen, it is essential to root out the reason the crash occurred in the first place. 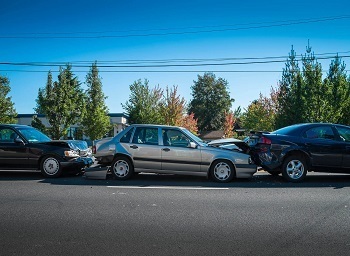 When more than one vehicle is involved in an accident, determining fault may be complicated. Let’s consider a hypothetical situation involving three cars. In our scenario, the lead driver is hit by the vehicle behind him while on a highway caught in a traffic jam. The second vehicle in the lineup was hit by a third vehicle. The rear car hit the second when they slowed down due to traffic congestion. The second vehicle was driving with enough distance in front of them, but their brake lights were not working. The rear vehicle was tailgating and had no indication that the car in front of them was braking because of the nonfunctioning brake lights. Who’s at fault in this example? Drivers two and three are clearly at fault. The second driver failed to maintain their brake lights, or an electrical defect was present. The third driver was tailgating and was unable to stop. Even if the second driver’s brake lights were functioning and did not impact on the accident, there is little chance the rear driver would have been able to stop in time. How Would the Jury Assign Fault in This Natomas Traffic Accident? While the precise assignment of fault might be different, depending on the jury, both the second and third drivers would have been responsible for hitting driver one. The second vehicle in the lineup might also file a claim against the third driver to recover damages and vice versa. A car accident injury lawyer would use investigative techniques to determine precisely what happened and offer evidence to support the claim. I’m Ed Smith, a Natomas car accident lawyer. If you are injured in a multiple vehicle accident, you will need the insight that an injury lawyer can provide. Call me at (916) 921-6400 for free and friendly advice. You can also reach out to me on my toll-free line at (800) 404-5400, or use my contact us page on my website, AutoAccidents.com. I’ve helped many residents of Natomas and Northern California obtain the compensation they deserve in all types of accidents, motorcycle and pedestrian crashes as well as in wrongful death cases. There is a nationwide forum of attorneys who have won more than $1 million for a client. I am pleased to say I am a member of the Million Dollar Advocates.